‍Stonemaier Games just announced a new release, My Little Scythe. Can you tell us about the game, and how it is different from the original Scythe? Jamey: Sure! My Little Scythe is a family-friendly game that was inspired by Scythe, but it’s very much its own game. It’s like if you took Scythe, distilled it down to a few core elements, removed some fiddly stuff (no more rivers! ), centered it in a new world (while it has cute versions of the animals in Scythe, it’s not set in the 1920+ universe), and added some really interesting mechanisms (discovery of resources via dice, pick up and deliver, upgrade tiles, etc). This is the third time that you’ve developed fan-made content into an officially published product. 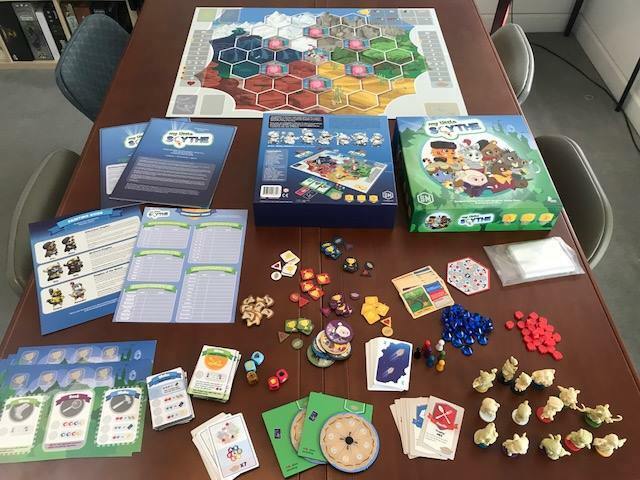 How did you first hear about My Little Scythe, and what was it about the game that captured your interest as a publisher? Jamey: That’s right! Two Scythe expansions were inspired by fan created content, and now this. Around this time last year, Hoby revealed the My Little Scythe print-and-play to the world. At the time, it had a My Little Pony theme (and many of the mechanisms were different than the final published version). I thought it looked neat, and I’m always happy when a fan creates something imaginative, but I didn’t give it much thought beyond that. ‍How was My Little Scythe officially signed by Stonemaier Games? Hoby: The actual signing was quick and easy. But the journey leading up to the signing was filled with incredibly fortunate circumstances, unbelievable support from the gaming community, and the desire to bring players of all experience and ages together. Never did we initially imagine having our homemade game published, but as interest in the game grew, it became clear that publishing was by far the best way for others to enjoy this game. What was it like collaborating with Jamey? Did Vienna also help with the playtesting and development of the game? Hoby: You really can’t ask for a better designer, developer, marketer, and publisher to work with. He represents the whole package for me and for a dad with a full-time job, this was huge. We all know that Jamey is an accomplished designer and publisher, but behind the scenes he is also a highly skilled project manager and developer. You don’t need to work through layers of approvals or bureaucracy -- he’s always available for you to make quick decisions and provide guidance. Jamey and I also value building and supporting the gaming community. Jamey’s commitment to his fans sets a high standard that I’m proud to be a part of. Despite his incredible résumé, he is very respective of your work and open to ideas. I think it’s this amiability and reflectiveness that allows Jamey to continuously improve. He’s an inspiration and a great role model for anyone who has the pleasure of working with him. ‍I was lucky enough to be selected as an early playtester for the game, and saw it in its early stages. How has My Little Scythe changed during the development process? Jamey: I really appreciate you and your gaming group testing this for us! I’ll let Hoby highlight a few things, but I want to say that it was a pleasure working as a developer for this game. Hoby is so open to feedback and iterative testing -- he did everything possible to maximize the fun of My Little Scythe. Hoby: The game has ‘grown up’ a bit to become a lot more satisfying for gamers of all ages. While we’ve introduced new elements, we’ve been adamant about keeping the game rules to a minimum and only adding new material if it made the game more enjoyable. Compared to the original PnP, some of the more prominent changes include support for 1-6 players (originally it was 2-4), a neat new way to locate resources, ability upgrades, and a climactic way to end the game. My Little Scythe is still the “main course” of a game night, but it is designed to be lighter and more accessible than the other games in the Stonemaier range. How did playtesters respond to this change in style? Jamey: You’re right, one of the submission guidelines for games we consider publishing is that they need to be the main event of a game night, not a quick filler (and also not so long that they can’t be played at a normal game night). 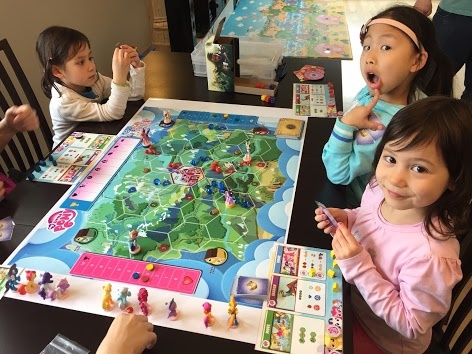 My Little Scythe plays in about 45 minutes, running a little longer or shorter based on player count (it goes up to 6 players). Our playtesters seemed to really enjoy it, even without playing with the final pieces (the miniatures in particular are beautiful--they’re huge, chibi-style miniatures). Hoby: For us, this project was all about creating even more game nights! We didn’t want time and complexity restrictions to prevent gamers (especially families and casual players) from enjoying a fun and engaging time together. 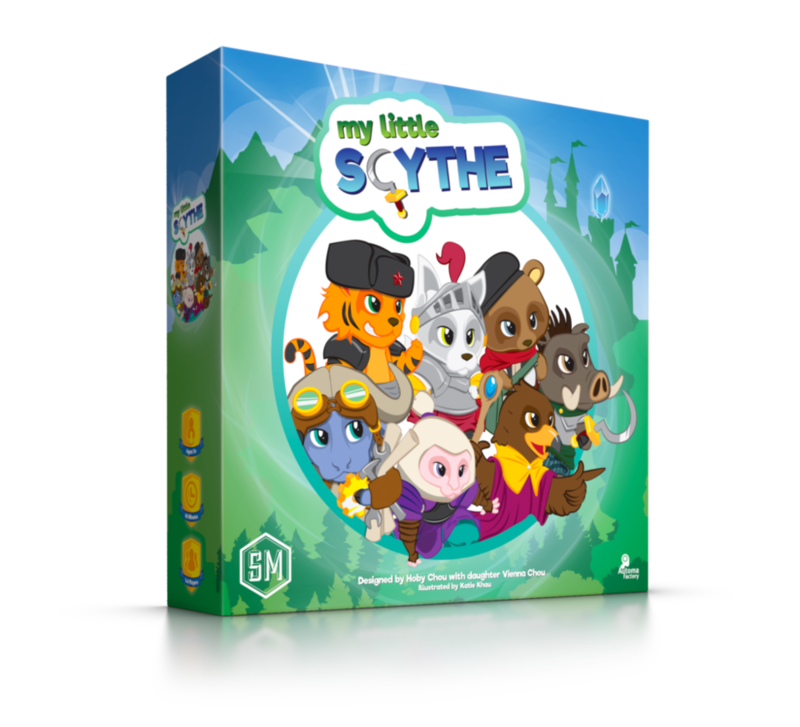 So if your game night happens to be a little shorter, we hope you consider serving My Little Scythe as the “main course”. Some playtesters admit initially thinking that they’d get over a “light” game pretty quickly. It was encouraging to hear that many of them continued to just play the game for fun even after 40 plays. My family’s record is 6 straight fun games, which made for a pretty satisfying game night! ‍‍Who is My Little Scythe for? Jamey: I never want to say a game is for “everyone,” but I honestly believe My Little Scythe comes pretty darn close. It’s for families, gamers (particularly gamers who enjoy Scythe, but also for gamers who like light- to medium weight games), and even newer gamers who are looking for an entry into the hobby. The rulebook is only a few pages and you can pretty much just start playing after setup, so you don’t have to sit through a long rules explanation. ‍Hoby: The vision was to bring something to the table that can be enjoyed by a wide range of players. We attempted to accomplish this by combining accessible rules together with strategic depth and a gender neutral theme. We didn’t want anyone to be turned away from the gaming table for any reason. But if you prefer to test your skills against an artificial opponent, I encourage you to try out the Automountie player developed by the talented Morten Monrad Pederson and his Automa team (it’s included in the game). When will My Little Scythe be available, and how can I order my copy? Jamey: My Little Scythe will be available worldwide in mid-August, with some copies available at Gen Con. You can pre-order from your preferred retailer or directly from our webstore. ‍Jamey didn't ask me to say this, but if you're planning on preordering from Stonemaier Games directly please consider first becoming a Stonemaier Champion. This goes towards supporting the 100 blog posts and 100 videos that Jamey creates every year to help other creators, entrepreneurs and game designers. In return you'll receive discounts on all preorders, free shipping within the US, and will even get the game early - all for just $12 per year. That's right, you'll basically get the value back immediately from preordering My Little Scythe, and will help support the growth of the gaming community!